Wolves may have given up a lot when they were domesticated by humans. Beyond the sacrificed dignity of being molded into something like a pug, a recent study found that domesticated dogs fair significantly worse when asked to learn from observation. While dogs’ ability to be trained by humans would suggest that they would be good pupils in a variety of scenarios, they performed much worse at tasks that were first demonstrated by a fellow canine. The test in question was to figure out how to open a wooden box containing a treat. Before gaining access to the box itself, wolves (Canis lupus) and dogs (Canis lupus familiaris) watched a trained dog demonstrate how to get the food. Some witnessed a solution using a paw, while others saw the trained dog use its mouth to open the puzzle. The wolves seemed to get the idea, with every one of the 14 test-subjects retrieving their snack. Domesticated dogs, on the other hand, seemed to have missed the point, with only four of 15 gaining access to the treat. To make sure the study was testing the observational skills of each animal, and not some other variable, researchers refined these results in different ways. To make sure wolves weren’t just better at problem solving in general, some wolves were tested without seeing any demonstration at all. This proved to be problematic, as those animals usually failed the test. What’s more, wolves that had watched a demonstration usually used the same paw or mouth technique they had witnessed, where whereas the dogs seemed to make their attempts at random. Finally, while the tests were initially done with six-month-old animals, the dogs were retested at nine months, in case their cognitive abilities had simply not been matured sufficiently during the first tests. When it didn’t make a difference, researchers really had to start piecing together why they were seeing this gap in the canines’ behavior. 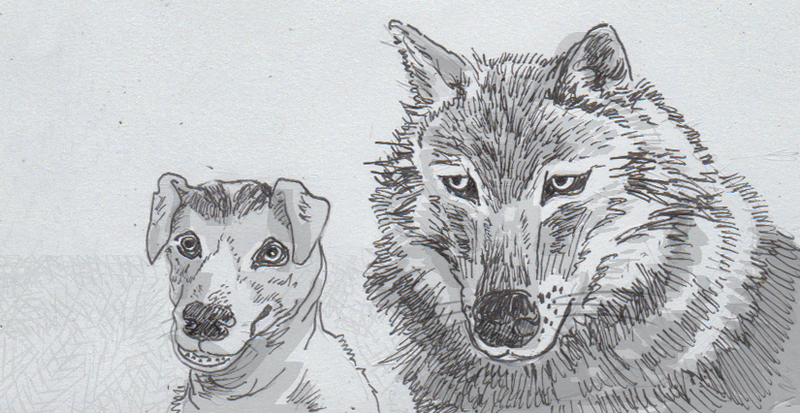 While domesticated dogs still retain some of their pack instincts, they can be much less reliant on group cooperation than wolves. Outside of direct interactions with their kin, dogs can afford to pay less attention to other dogs as long as they’re watching for cues from humans. Wolves instead need to coordinate and learn from their peers for survival, and can relate actions by a non-wolf to their own. This trait may have actually supported their eventual domestication, as such learning would have helped them build and understand bonds with humans when they started living together 15,000 years ago.